District Cooler pouches feature the brand logo on one side and are transparent on the other side. Pliable, spill-proof plastic containers hold 16-ounce servings of three specially designed adult beverages. What parent hasn’t satisfied a kid with one of those pliable plastic pouches containing a branded juice or fruit drink? Well, this past summer those parents got their turn, at least if they were fans of the Washington Nationals Major League Baseball team. Available all season at Nationals Park was a choice of three specialty cocktails that were served in plastic pouches very similar to what you see your kid slurping Capri Sun or Kool-Aid Jammers from, except that they are bigger. The pouches hold about 16 ounces, including ice, versus the 6 to 7 ounces typical of the kid beverages, but the principle is the same: a completely enclosed package, except for the straw, which makes it easily portable while almost completely eliminating spillage. Three District Cooler cocktails were available exclusively in pouch packaging: (from left) Bourbon Cherry Sling, Pineapple Tequila Cooler and Electric Vodka Lemonade. The idea was the brainchild of the Levy team at Nationals Park, led by General Manager Lou Morga. Levy operates concessions at the ballpark. The Levy team created three specialty cocktails that would be served exclusively in the pouches: a pineapple tequila cooler, an “electric” lemonade made with vodka and a bourbon cherry sling, thus providing a choice of drinks with three of the most popular liquor bases. The three cocktails are also especially colorful, with garnishes that are visible in the pouches, an important consideration that added visual appeal to the choices. The containers are fully transparent on one side and boast the District Cooler logo (also developed by the Levy team) on other side along in the home team’s red and navy blue colors. 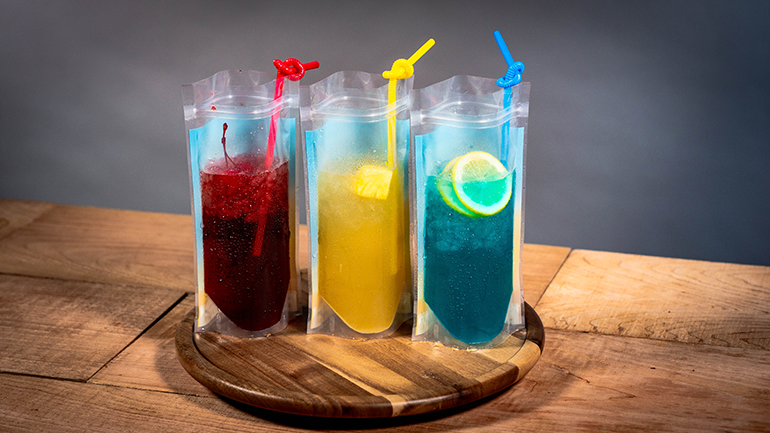 The pouches, priced at $14 and available only at the ballpark’s District Cooler Bar, were filled from a custom-built refrigerated draft cocktail dispenser by bartenders who then added a colorful curly straw and sealed the package before handing it to the customer. Introduced before the season on media day, the District Cooler pouches proved fairly popular, selling around 250 drinks on an average day. Sales hit their peak at the 2018 Major League All Star Game, held rather propitiously at Nationals Park, when some 400 were sold. The electric lemonade was the most popular of the three concoctions over the course of the season, Morga observes, probably due to the general popularity of vodka-based drinks. Morga says the team is evaluating whether to expand the number of outlets where the drinks are dispensed for next season, and is also looking at whether to alter or expand the drink menu.